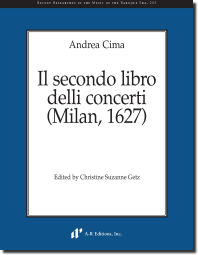 Andrea Cima was among the most celebrated organists active in Milan during the early seventeenth century. Cima’s Il secondo libro delli concerti of 1627 not only records the convergence of the composer’s skills as an improviser with his experience of collaborating with the city’s solo singers, but also stands as one of the only living documents of music heard at Santa Maria delle Grazie and Santa Maria della Rosa, two of Milan’s leading Dominican churches, during the early seventeenth century. Cima’s Il secondo libro delli concerti (Milan: Lomazzo, 1627) contains twenty-three sacred concertos for two to four voices and organ; the organ part is notated in partitura. Although Il secondo libro delli concerti lacks a Magnificat, its featured texts suggest a volume intended primarily for use at vespers. The psalms, when taken together, do not form a single common cursus; they rather offer options for use on a variety of feasts. Also characteristic of the Lomazzo prints in particular and Milanese collections more generally is the dedication of selected concertos to individual singers who either had sung or were capable of singing them. Aside from the twenty-one concertos by Andrea Cima that comprise the bulk of the collection, Il secondo libro includes a concerto a 3 by Andrea’s brother Giovanni Paolo Cima (ca. 1570–1630) and a concerto a 4 by his nephew Giovanni Battista Cima (1596–1654).